Chet Baker was keeping me company in the kitchen as I threw together a quick dinner. It seemed to work out perfectly as I was pairing a unique voice in the music with a unique ingredient to add to my cous cous.. pomegranate seeds! If you have not tried them, please do. They are perfect in the winter time, and add little pops of sweetness to any savory or sweet dish. This one’s so simple. Ready in a matter of minutes. So press PLAY on the song below and go get started! Cook cous cous according to directions with chicken stock. Meanwhile, in a pan heat oil over medium. Cook kale for 4-5 minutes or until it reaches desired tenderness. Add 1 tbsp of water at a time if pan becomes too dry. 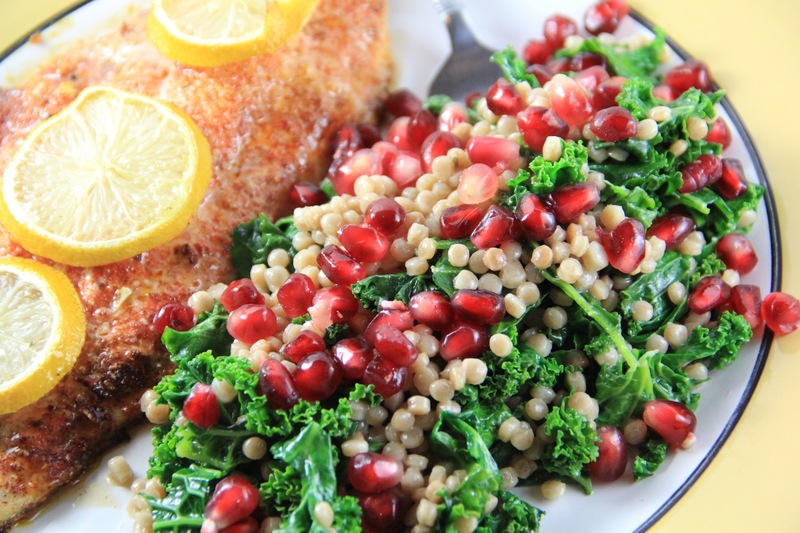 Once cous cous is done, stir it into kale, and add pomegranate seeds. Season to taste.